This is a very beautiful vesha. It is done before the night time ‘pahuda’, when the deities can take rest. 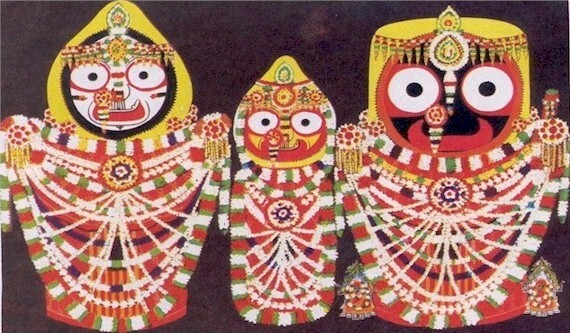 Simply stated, it is the ‘night dress’ of Jagannath and siblings Balabhadra and Subhadra. It is therefore the vesha the deities appear in the following morning, for mangala arati. This vesha is mostly made of different kinds of flowers. The Lords are decorated with flowered ornaments known locally in Puri as adhara, jhumpa, gava, chandrika, tilak, alaka, guna, hruda pallava, karapallava and tadaki among others. The Deities also wear many flower garlands, some with tulasi leaves, and silk clothes called khandua. Costume Of Lord JagannathOn each and every day, the Abakash Besha (vesha) of Sri Lord Jagannath is made soon after completetion of Mangala Arati & Mailam. The schedule time of this Besha is between 6 AM to 6:30 AM . The morning brushing of teeth and procedure of bathing of deities is known as Abakash. It is said that this abakasha vesha has been inducted into the daily rituals by Acharya Sankara i.e. Adi Shankara, in the 9th century B.C. during the reign of HRH Gajapati Maharaja Jajati, who ordered its induction into the daily rituals. 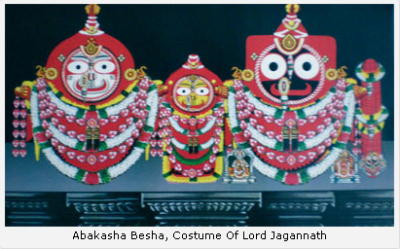 In this Besha, the Puspalaka is offering three Pata to each Deities i.e Lord Jagannath, Balabhadra and Subhadra. One Cloth ais lso offred to Lord Sudarshana . In addition to that the napkins are also offered to Jagannath & Balavadra as ‘Utariya’ during this Besha. This ancient invocation embodies the man’s perennial quest for Light, which is synonymous with the Supreme Being. All ancient religions in the world have revered “Light” from time immemorial and designated the time of conjunction between darkness and light (Sandhya samaya) as especially sacred for worship. While day represents “jagrithi” (wakefulness); night represents “sushupthi” (state of sleep), and the brilliant twilight represents “Swapna” (the dream-state), the junction of the conscious and the unconscious, where everything gets dramatically colored and highlighted. The fourth dimension is the “thuryavastha”, which is indefinable and permeates all states, like ether, the “Akasa tattwa”. Just to illustrate..this is most akin to the fleeting, trance-like state of the pale pre/afterglow. It is like the vibrating silence that follows “AUM”. It is where the soul is in its highest state of “nirvikara” … and closest to God. This is the time of “Nitya Deepaaradhana”, a daily Hindu ritual of lighting the lamp during dawn and dusk, which signifies man’s basic desire to stay close to Light/Dharma, and derive comfort, despite the apparent and sometimes, overwhelming darkness. Infact, Light is an inextricable part of Hindu sensibility. From birth to death and even beyond, lighting of a lamp accompanies virtually all activities. Blue, White and reddish Gold, representative of Durga/Parvati, Saraswati and Lakshmi and lighting of the lamp is to ignite/launch/channel the three guiding shaktis (Iccha/Gyana/Kriya shaktis) of human destiny into action for our benefit. Fill a vessel called “Prabodha” (teachings of Guru) with oil called “Vairagya” (detachment) and put a wick called “Bhakti” (devotion) and let the lamp of wisdom glow gently within and without, at the feet of God. Where the heart is touched by the Divine Spark, the mind is truly enlightened and both are immersed in the constant contemplation of God, inner light pours out from every pore, says Taittiriya Upanishad. And that person will himself grow into a “Viswamurti”, because Lord Krishna in Bhagavadgita emphatically says that He’s the “Tejas”(brilliance) of the Sun, the Moon, the Agni and wherever else it is found. In Purusha sooktam, the description of the Viswamurti goes like, “chandrama manaso jaatah chaksho Suryo ajaayatha…” establishing Eyes and Heart as the twin primary seats of Light /luminaries in the human body. 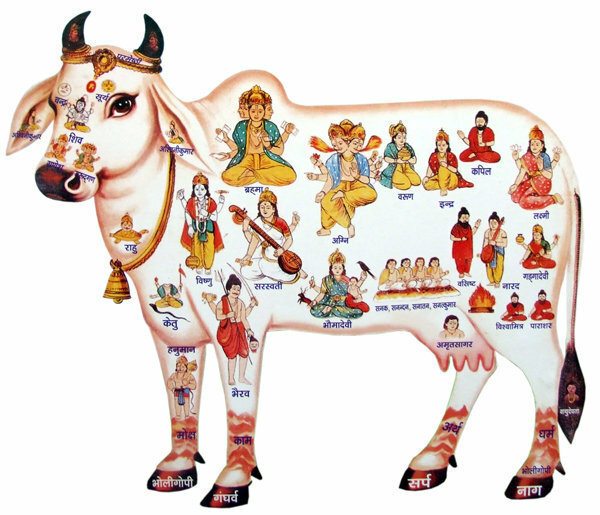 Now, relate this to Jyotish Sastra which is identified with the eyes of kalapurusha…and there, in the center/core (Bhrumadhya) lies the Third Eye/Aagya chakra, the seat of wisdom and intuition, ruled by Jupiter, who alone can unlock a shimmering path into the sheer, translucent Light that is Sahasrara Chakra and Mother.